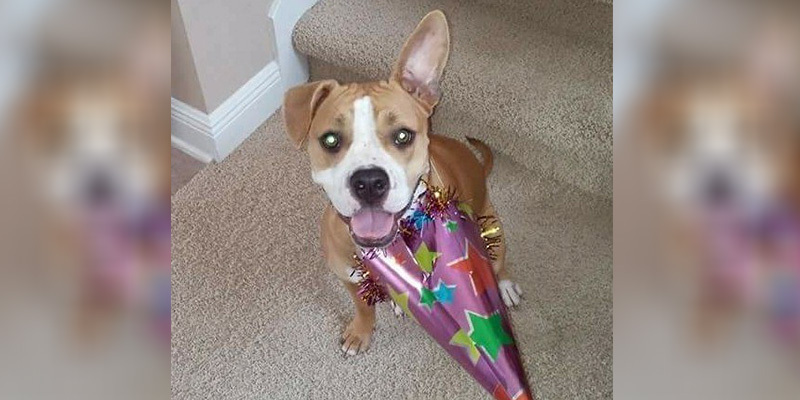 A family who moved to Bermuda recently were devastated when their beloved dog escaped from workers when they were getting ready to load her on a plane at Tampa International Airport are now celebrating after their dog, Brady, was located. Finally, on October 11, everything was set to bring their dog to their new home. However, they were contacted by officials telling them that their dog ‘Brady’ had chewed through her crate and escaped Tampa International Airport. According to Fox 13 News, “since then, an army of complete strangers has stepped up to search for her missing canine. The next morning Christia Pennell was reunited with Brady. Pennell plans to stay in Tampa until Brady is healthy enough to fly and the family is looking into options to make sure the dog successfully makes it to Bermuda this time. A post made this morning on an the ‘Bring Brady the TIA Dog Home’ Facebook page said, “I am searching for a Private Charter Plane to bring Christie and Brady home to their family. There is no way Christie is going home without Brady being on the seat right next to her. first.. a dog that can chew through METAL. second..20 Grand for a flight. Well , I suppose if you take all the ones that still get suckered in with the telephone microsoft wondows calls , the Nigerian mail scams, the ‘give me your money now and I’ll come back and paint your roof later’ and pyramid schemes out of the equation I guess there’s a few left that aren’t stupid . and IF this is a true situation,then fly out and fly back with the dog on a regular flight. Dis dog de PLP mascot? Only dem byes sposed to get dat type of money and pampering! How about coming in on one of the container ships? Maybe they have extra rooms on the boat for a passenger and their dog. Uh, uh, one of de dock workers might get a parking ticket, den Dey have to turn de ship back round. 20 grand to get back to Bermuda? Wouldn’t a private jet cost about that? It’s her dog let her pay for the transport! Now Bermuda does dog charities to catch planes… you can’t just make these things up! Don’t tell Walton, dis pooch is an immigrant, wiv poochie doggie rights. Or a sturdier kennel and actually taking the time to let the dog get used to being in a kennel for an extended period so it wouldn’t try to escape again. Cujo heard about Walton and din wanna come to a place wiv no poochie rights. I setn my dog to California for less than $2,000 on US airways I beleive it was. I think you need to stop miling it. Also, it’s very suspect to me that I never see the breed mentioned. Most liekly because it’s some form of Pit bull. My family dog’s life was threatned for being Pit but here we are brining yours in? Doesn’t add up. THIS is called privelage. enjoy. Un-effin-believable. This whole story is just pitiful. WTF is wrong with these people??? He ain’k got no choppers lef, an if de PLP wanna fly Im in, s’okay, s’only tax dollas…. Nah, got sum PLP in it. What a bunch of heartless people!! Personally, I’m thrilled to see that Brady has been found. My dog must have been frightened by all of the activity when we were moving house, and ran out the door when the movers came. It was heartbreaking moving to another area and leaving him behind. I spent hours traveling back to the old neighborhood and looking for him on a daily basis. I wouldn’t rest until I found him, and eventually I did. So I know what this family went through, and I’m glad that it had a happy ending. not heartless,just not stupid either.